(CNN) -- Opposition leader and supermarket mogul Ricardo Martinelli has won Panama's presidential election, the head of the country's electoral tribunal said Sunday. Ricardo Martinelli delivers a victory speech after Panama's presidential election Sunday. Martinelli, of the conservative Democratic Change party, edged out former Housing Minister Balbina Herrera of Panama's governing Democratic Revolutionary Party, said Erasmo Pinilla of the electoral tribunal. A final vote count wasn't immediately available Sunday evening. 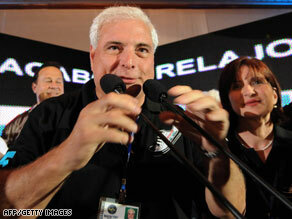 "This is a victory for all the people of Panama," Martinelli said. "And I make a call to all our opposition -- to all the parties that opposed us -- that you all are all Panamanians. ... Tomorrow we have to start a new day." Martinelli also ran for president in 2004, when he came in fourth with about 5 percent of the vote. President Martin Torrijos won that election with about 47 percent of the vote.